Keep your shower watertight and mildew-free by using the following steps to refresh the caulk in your enclosure. There’s nothing quite like a steamy shower to rejuvenate your mind, body, and spirit after a good night’s sleep or a long, hard day. But when the caulk around your enclosure begins to crack and crumble, it’s not you that needs reviving—it’s your shower. 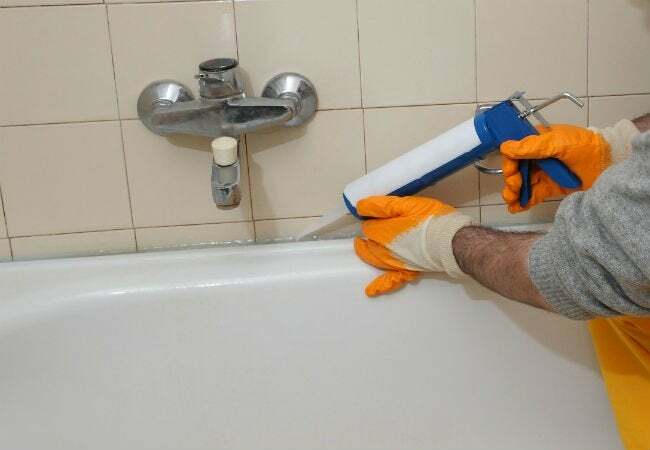 Replacing the caulk around your tub, tiles, shower door, and drain is a relatively simple do-it-yourself fix that takes only a few hours from start to finish. Read on to learn how to caulk a shower and create a good, tight seal. Remove any old strips of caulk in the shower. Use painter’s tape create a guide for the new caulk line. Apply either silicone or latex caulk with a caulk gun, or squeeze the product straight from the tube. Wipe along the caulk line with a wet finger to remove any excess. Last but not least, let the caulk cure for 24 hours. A quality caulking job begins with a quality product. There are two primary types of caulk you can choose from: silicone and latex. While silicone forms the stronger seal, latex is easier to work with, especially if you’re a beginner. Many DIYers compromise by choosing a sealant like DAP Kwik Seal Plus (view on Amazon), which employs both silicone and latex in its formulation, delivering the best of both worlds. Important: Before purchasing caulk for your project, double-check the label to make sure that the product has been designated for use in kitchens and baths. These formulas contain special inhibitors that protect against mold and mildew—a quality that’s certainly necessary when you set out to caulk a shower. Before you apply the new caulk, be sure to remove any leftovers from the last job, otherwise your fresh bead won’t bond well. Using a utility knife or oscillating tool, cut through the strips of old caulk. Scrape off as much as possible, and then apply a specialized remover to any stubborn spots. If you discover any mold in your path, eradicate it with a commercial cleaner or a homemade solution of one part bleach to two parts water. Once the old caulk has been removed, wipe down the area and allow it to dry thoroughly before moving on; caulk won’t adhere to a wet surface. While you can apply caulk by simply squeezing it out from the tube, it’s best to invest in a quality caulk gun. This will let you better manage the flow and will, as a result, produce more accurate results. Since these are relatively unsophisticated tools, even the industry’s best typically don’t cost much. For example, many pros who caulk for a living swear by Cox caulk guns (view example on Amazon)—a durable, high-performance tool that typically retails for under $30. With any caulk gun worth its salt, however, you get a sturdy plunging mechanism that allows for precise and even distribution of caulk, and you get a pressure release that lets you quickly pause or stop application. When loading your chosen caulk gun, just remember not cut off too much of the tip from the caulk tube. A wide opening will yield a thick bead, which may lead to sloppy results. Cut the tip just above the indentation point that is usually marked on the tube. Painter’s tape makes a great guide to ensure a clean bead. Use long strips of tape to mask off the surface on either side of the line where you’ll be applying your bead of caulk, whether that’s along the wall, shower door, or tub. To start the bead, apply pressure to the caulk gun or tube and either pull the gun away from your starting point or, holding the gun at a 90-degree angle, push the caulk in a forward motion. There is no true right or wrong technique, so choose the approach that works best for you and proceed accordingly. Once the gap is full, wet your finger and wipe along the line to remove the excess caulk and create a smooth, rounded bead. Peel off the painter’s tape while the caulk is still wet, and then continue on to the next section to be caulked. When you’re done, allow the caulk to cure for at least 24 hours before retuning to regular use of the shower. A thorough caulking job should last at least a year—which means you have around 365 more chances to belt out your favorite show tune before you’ll have to repeat the process and caulk the shower again.